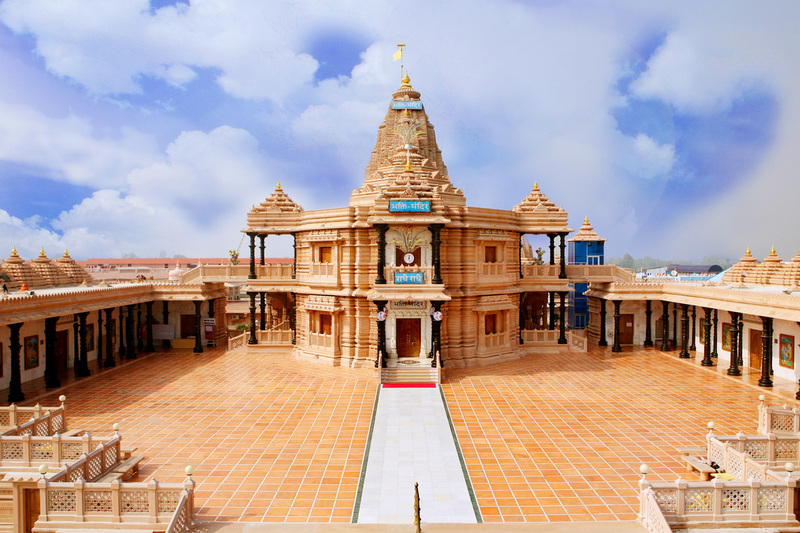 In Vrindaban, by the grace of Shri Radha, He only engaged in loving pastimes with Shri Radha, the Gopis, Nand and Yashoda, and the cowherd boys. There He profusely and exclusively showered the nectar of love, thus He was referred to as rasik shiromani (रसिक शिरोमणी) or the supreme embodiment of divine love, रसतम: (rasatamaḥ). Shri Krishna is the Governor of innumerable divine powers. The highest and most unusual power of these is the power of love. Any power naturally remains under the control of its power-holder. But the divine love power of Shri Krishna is so unique that it does not remain under His control, rather it controls its power-holder Shri Krishna Himself. All the pastimes of Braj are the example of this fact. Another aspect of this philosophy is that all the powers of God are always divine and personified. There are eight personified levels of divine love power. The highest level of love is called mahābhāva (महाभाव). Mahābhāva is divided into two branches called rūḍha (रूढ़) and adirūḍha (अधिरूढ़). Only the eternal associates of Shri Radha known as the Gopis are at this level. Adirūḍha is higher than rūḍha, and it, too, is divided into two branches called modana (मोदन) and mohana (मोहन). Modana is the apex of the collective nectars of divine love. Only Shri Krishna and Rādhā are at this exclusive stage of love. The same modana becomes mohana in the ecstatic state of separation. Yet above all these stages of love there is the stage of madan-mahābhāva (मादन-महाभाव), which is exclusively reserved for Shri Rādhā. Shri Rādhā is the supreme embodiment of madan-mahābhāva. 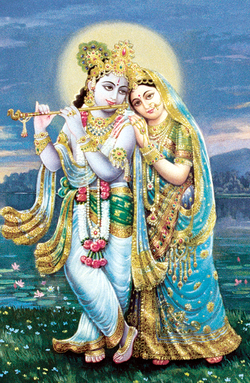 Shri Radha's natural expression of this love is to be happy only in happiness of Her beloved Shri Krishna. This means that for a devotee, seeking self-happiness through one's practice of bhakti is contrary to the supreme example of Shri Rādhā's divine selfless love. The perfected state of this love is found only in the Gopis or eternal associates of Shri Rādhā or the followers of Her associates. The devotees who practice bhakti and follow this example of Shri Rādhā's love, attain access to the pastime of mahārāsa (महारास), where unlimited nectar of every kind (aka divine-love-bliss) is incessantly enjoyed. There is no higher bliss beyond this experience. 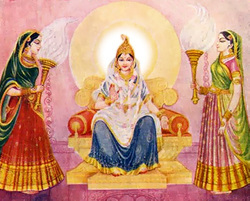 Even Lord Shankar assumed the form of a Gopi in order to be able to participate in this divine pastime. So, those who selflessly love Shri Krishna as their Beloved and Shri Radha as their Governess can participate in mahārāsa, but only with the permission of Shri Rādhā. This class of love is called rāgātmikā bhakti (रागातमिका) when it is expressed by RādhāKrishna's eternal divine associates. The bhakti practiced by devotees who love Shri Rādhā Krishna exclusively with the aim to serve Them for Their happiness, without regard to any rules or regulations recommended by the Vedas, society and so on, is called rāgānugā bhakti (रागानुगा). Devotees who wish to reach up to this level of devotion have to follow the above mentioned philosophy of love under the guidance of a Rasik Saint, who guide the devotees on this path with clear revelation of the secrets of this philosophy. You can read a complete description of this philosophy in "Prem Ras Siddhant" (The Philosophy of Divine Love) by Jagadguru Shri Kripalu Ji Maharaj.